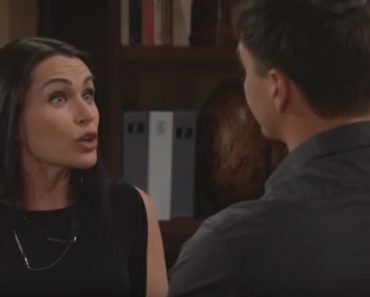 The Bold and the Beautiful fans are not all that surprised that things are taking a very interesting turn right now, but we are all surprised that things are going as they are. Hope and Liam had visitors in Wyatt and Sally. They came to share their condolences and see what they could do to make things better. The visit turned into a long moment of Hope and Wyatt discussing their past and the times they were able to share together, and it was a nice visit. Sally probably learned a lot about the man she loves, and things did seem to take a nice turn for Hope for a few minutes when she was distracted thinking of the past. Things don’t seem to be going her way right now, otherwise, so this is a situation that might just help her remember that she still has a life of her own to live despite her loss and the sadness and grief she feels. She will never get over this, and it will never not hurt, but she can still live. And then there is Katie, who is happy that Bill is happy with their son. She was so happy that she saw Wil and Bill bonding that she actually took it upon herself to invite him to stay for dinner with the family. She did ask her husband for his opinion, but she definitely persuaded him to say yes. Thorne is not a fan of Bill, and he didn’t want to share his dinner table with this man. But, he did, and it was fine. And now things will turn around for them in some way, but not before it gets worse for Thorne. They are certainly not going to have much of an option to help them with their situation, but this might just work. We just hope that Bill’s sudden desire to be a good father doesn’t disappear in the near future. He’s doing such a good job of what this is all about, and we want to see him do more. Thorne is not happy. He wasn’t all that thrilled when his wife wanted him to agree to let her ex stay with them for dinner so he could spend some more time with their son, and now he’s less than happy watching the three of them interact like a little family. He feels like the odd man out in his own home, and that’s not where he wants to be in his life. He’s not in a good place otherwise, and he is not going to sit down and allow this to pass in his situation. He’s a man who doesn’t have much to offer in terms of his history with Katie, but Bill does. And he’s not enjoying watching them play family – because they were a family and Bill cannot be trusted. We suspect this might lead to some bigger issues. To round out the week, we might also see a few other things happening. For one, we are going to see that Sally has a very special gift for Hope. She’s been very touched by the young mother who just lost her baby, and she knows that Hope has always been a wonderful friend and very important part of her own boyfriend’s life. She’s making sure that she can foster her own nice friendship with Hope even after they did not get off the best start. What she’s going to do for her is touching and kind, and Hope will not miss the sentiment behind this gift. It will make her feel loved.